Lady Indians Fall To Wolverines Of P.A.C. On Wednesday the Varsity Indians welcomed Prince Avenue Christian to Hiawassee for a region softball match up. The Indians came in at 2-7 overall(2-3 in Region) with the expectations of getting the tribe back on track. The Wolverines would score early and never look back. Scoring one in the first, three in the second, four in the third and five in the fourth, Prince Avenue had a commanding lead that held through out the game. The Indians never gave up and fought to the end but fell short to a good Wolverines team. The Indians put up one run in the third and four in the fourth to slim the lead. Scoring in the two innings were Lea Neumyer, Jenna Coker, Ella Burry, Rylie Livingston and Sofia Shook accounting for the 5 runs on the Indian side of the board. In the circle for the Indians Natalie Smith went 2 and a 1/3 innings throwing 79 pitches and on 5 hits allowed 7 runs with four of those being earned. Smith had 4 strikeouts and walked 6. Abby Mauldin went 2 and 2/3 innings throwing 51 pitches allowing 6 runs with 1 earne on 4 hits. Mauldin had no strikeouts and 4 walks. Mauldin gave up one home run to the Wolverines. Both teams went quietly in the fifth inning giving Prince Avenue Christian the GHSA mercy rule victory over Towns 13-5. 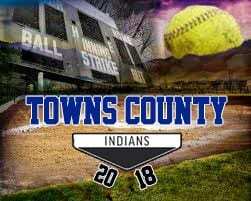 Next up for the Indians will be on Saturday the 8th at Young Harris College for a 4:45 PM start.